Indigenous woman looks out of window. Brazil. Progress that destroys traditional culture, language, land and human heritage “is not development, but willful destruction”, the UN Deputy High Commissioner for Human Rights said on Wednesday, in defence of indigenous peoples everywhere. Kate Gilmore’s comments were followed by the UN Special Rapporteur on the rights of indigenous peoples, Ms. Victoria Tauli Corpuz, who expressed concern at a “drastic increase” in attacks against indigenous peoples, and efforts to criminalize them. In her address to the Human Rights Council, Deputy High Commissioner Ms. Gilmore urged Member States to push for the “full inclusion” of all 370 million indigenous peoples in the 2030 Agenda for Sustainable Development, which calls on all nations to eradicate poverty and inequality. Few communities were so vulnerable, she insisted, judging by their depressed social and economic situation in around 70 countries today. 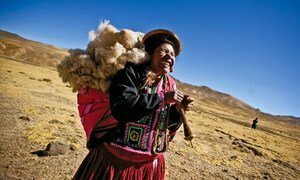 “While but five per cent of the world’s population are indigenous, near to a third of the world’s extremely poor rural people – the most left behind - are indigenous – over 30 per cent,” she said. They are the “living example of the world’s most disadvantaged, most marginalised, most left-behind people”, she added. Underscoring the core principle of the SDG Agenda to “leave no-one behind” which the international community committed to in September 2015, the Deputy High Commissioner noted that their aim is also to “reach the furthest behind first…so many” of whom, are indigenous peoples. To ensure that their rights are fulfilled, Ms. Gilmore highlighted the need to guarantee their basic freedoms – something that State and non-State actors have attempted to suppress, preferring to “silence, punish - even criminalize” - indigenous human rights defenders. Kate Gilmore, United Nations Deputy High Commissioner for Human Rights at the 37th Session of the Human Rights Council, Palais des Nation. 26 February 2018. These measures included “public rhetoric denouncing and diminishing their rights”, wrongful deployment of anti-terrorism laws, denial of the right to a fair trial and impunity for violence against indigenous activists, she added. Echoing that message, the UN Special Rapporteur Ms. Tauli Corpuz highlighted the link between threats aimed at indigenous peoples and large-scale private industrial projects involving “extractive industries, agribusiness, infrastructure, hydroelectric dams and logging”. “These violations are occurring in the context of intensified competition for and exploitation of natural resources, as observed during country visits and reflected in the increasing number of related allegations,” she said, adding that “in several countries”, increased militarization had added to the dangers faced by indigenous peoples. To improve equality for indigenous peoples, the Deputy High Commissioner’s other recommendations included an appeal to States to gather more accurate data to assess the scale of their first nation communities. She also called for the empowerment of indigenous peoples whose voice should be “amplified” in all discussions about their development. Victoria Tauli-Corpuz, Special Rapporteur on the rights of indigenous peoples, at a press briefing on 16 April 2018, at UN Headquarters in New York. Some progress had already been made in this area, Ms. Gilmore said, referring to the participation by indigenous peoples at the High Level Political Forum on Sustainable Development in July, before adding that their inclusion and participation was also needed at national and local levels. Although the Special Rapporteur’s findings were questioned by some Member States including Russia, which said that one-third of her report consisted of previously published legal assessments, there was support from others. This included Australia, which, along several other Member States, expressed concern over the increasing amount of attacks on indigenous human rights defenders worldwide. 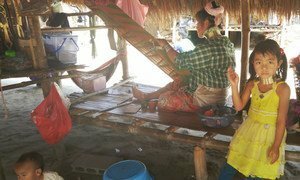 Celebrating some 370 million indigenous people across 90 countries; marches, ceremonies and a host of other initiatives took place across the world, as the United Nations marked on Thursday the International Day of the World's Indigenous Peoples.